We invite you to the discussion, workshop and the market of ideas on growing, cooking and dining, on cookbooks and the relationship of cooking and artistic work. The aim of the project is the practical reflection about the changes of the role the food has in society. We want to present the recipes of dealing with the food that consider the local conditions, use ecological approaches, are inventive and stress the social aspects of food. The first part of the event will take place on the terrace of A2 magazine, located in Vinohrady district. From 6 PM in the evening you can experiment in cooking together with the cook who comes from Holland and lives in Prague Filip Kavka-Smiggels (www.vegetariania.cz/), using common kinds of food from which variable, non-common kinds of dishes will be produced. 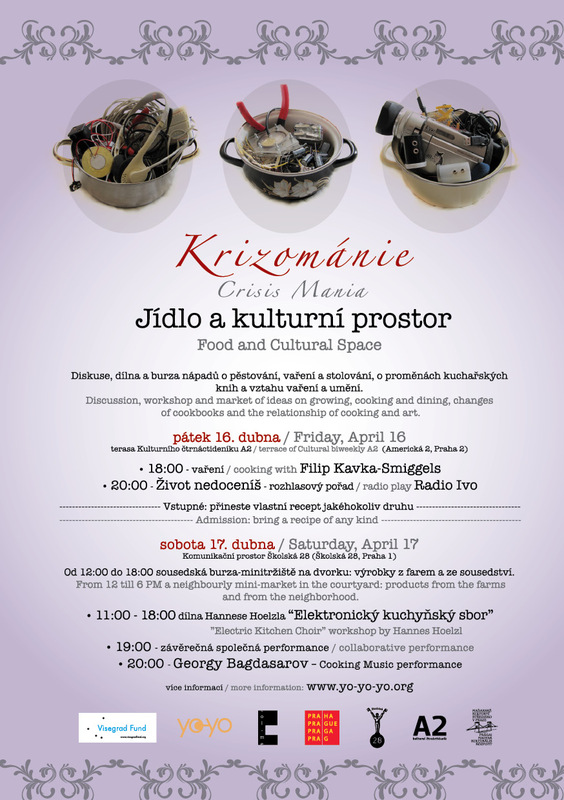 After – starting at 8:00 PM – follows a live performance of the radio play Život nedoceníš directed by Romana Bohunská, by Petr Marek, Johana Švarcová and Marian Moštík: Radio Ivo (http://unarclub.sweb.cz/RadioIvo.html). Admission: bring a recipe of any kind. Visitors can also present their recipes it in a short lecture or performance. Bonus: there will be a raffle in which you can win unexpected little and bigger treasures. The event opens the program of discussions, performances and concerts on the A2 terrace, which will follow the themes of the specific A2 issues - Nr. 8 (published on April 14th) is devoted to the theme of Cookbooks. From 10 AM till 6 PM there will be a workshop with sound artist Hannes Hoelzl (IT/DE), Michal Cáb and Michal Kindernay, the result of which will be an evening performance, combining electronics and cooking. Hannes Hoelzl will together with the participants of the workshop “speaking through food” analyze the acoustic and resonance characteristics of various forms and consistencies of food, creating objects - speakers. Participation in the workshop is open to public! Playing the objects, creating a choir of weird culinary sounds. From 12 till 6 PM a neighbourly mini-market will be organized in the courtyard of the gallery, where you can bring your own goodies, can taste or buy local dairy (and other) products, pastries, teas or fresh vegetables from the neighborhood and from the farms (presentation of the farmers' initiative www.najdisisvehofarmare.cz); discussion about how could the local Prague markets be re-established and how to bring life and liveliness back to the streets. Projection of the video interviews. Project Crisis mania is organized by non-profit organization yo-yo together with Cultural biweekly A2 and Školská 28 Communication space. 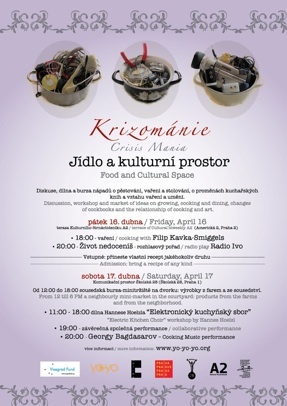 Partners of the project: Col-me (SK) and Art Sector Foundation (HU). With the support of: International Visegrad Fund; City of Prague.